A unique document is the diary of Moses Vita Cassuto, written in the first half of the eighteenth century and describing his two journeys, one to Palestine and one to England and Holland. Here the second journey to England, Holland and Germany starts. His second journey is without explicit explanation, but was evidently undertaken largely for business reasons. in a carriage, with his trusted servant, Isaac di Tranquillo Gallico, following on horseback. They got there that day. There they were to meet Jacob Belillios of Venice with Abram Jesurum, also from Venice, and Manase di Masia, with Levi Levi, his servant, both from Sana in Persia . where next day they embarked on a felucca for Genoa; it came in sight on 18 May. He had been in Genoa in 1723 for six months to choose and to marry his wife. They sai1ed on, intending to reach Nice, but were driven off course, and on 19 May they reached S. Remo. they reached Nissa (Nice) in Provence at midday in time for the Feast of Roses, for which they stopped; there the Jews were numerous, with a ghetto and a beautiful synagogue. On visiting it they were all called up for the Reading of the Law, and were treated with much courtesy and lodged in the house of a certain Moscato from Monte S. Savino. The city was fortified strongly; here they spoke Italian and Provencal, but French fashions were followed in dress. On 23 May they left again in their felucca for Antibes and changed to travel by coach and horse. 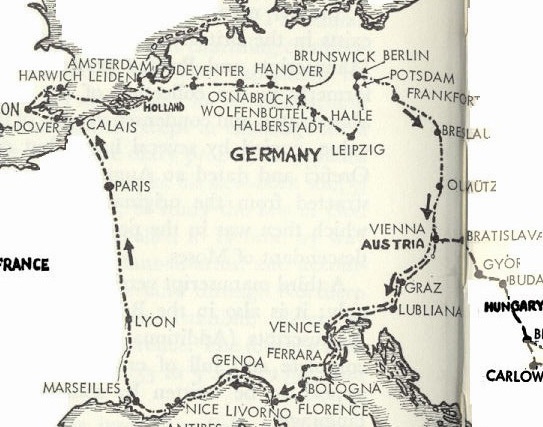 On 26 May he reached Marseilles, which is described at length. He left on Sunday 4 June in three covered carriages drawn by mules, with a saddle horse and mu1es carrying bells, for Lyon, passing through the County of Avignon, which belongs to the Pope by the free gift of a King of France. It is administered by a Papal Legate, and the Hebrews there wear the mark. He reached Lyon on 9 June. On 4 June he reached Paris, the sights and delights of which, with Versailles, he describes in much detail. He was particularly curious to see the Royal Library. Since he did not wish to appear less learned than the other students there, the first thing he did was to put on his spectacles and ask to take down some Hebrew books, which greatly impressed those there. 'They took me for a man of depth and much more when I asked for a very old book of the Talmud, which they then produced for me. Then I sat at a table, to turn over the pages carefully and note what I showed I had found appropriate. The Chief Librarian was reasonably well versed in this language, which he read and spoke with little difficulty'. Then he looked for some Greek books; he glanced at them but confesses that he could not understand them, and took out his watch, and explained that he must leave to return some other day. as the French think, since they use the expression of a wealthy man 'as rich as a Jew'. One day after luncheon at the inn where he was staying he invited some Knights who wished to eat the food of the Hebrews; they joined him again in the evening. Then he went by arrangement to the residence of Cardinal Fleury, having been introduced to him by his compatriot Sr. Pietro Galli, of Pistoia, secretary to Abbot Franchini, Tuscan Minister to the French Court. Galli was an intimate friend of the Cardinal and had lunched with him that very day, as he often did. The Cardinal asked jokingly for the diamond which he said Galli had stolen. but the Cardinal, after consulting his nephew the Duke and other princes present, refused to recommend it for purchase to the King (Louis XV) at the present time. The same reply was given by his secretary. story of an Armenian who was offering around the stone del scerimano and had almost effected the sale through a favourite lady of the King when the matter came to the notice of the Cardinal who ordered him to leave the country within twenty-four hours. But the subject of the great diamond became known to all the Court and aroused much curiosity but he could not show it to them until the King had seen it. And though he attended Court and was addressed by the King as if they had conversed a hundred times, the King did not desire to see it. 26 July he left Paris for Calais, arriving there on 28 July at midday just too late to catch the packet-boat to Dover. He was consequently unable to leave until 31 July in the evening, when they made the crossing in eight hours. At Dover he spent the night, then left for London by way of Canterbury and Rochester, reaching London on 2 August. Then follows a long account of London and London life. There is much about St. Paul's Cathedral, Protestants, nonconformists, and preachers. before passing on to dwell on the different districts and their trades and what is to be bought in the shops. He is much struck by the extent of the trade by sea with Portugal, which produces wine and, through Portugal, gold and precious stones from Brazil and Peru; ships arrive from Portugal daily and there is a weekly packet-boat from there; he mentions that the new diamond mine discovered in Brazil recently and belonging to the King of Portugal is exclusively producing stones for the London market, and with those from Fort St. George (Madras) this makes up most of those now available. This comes in for discussion further below, as will be seen. A description of the Royal Exchange and the coffee-houses is followed by that of the synagogues. There are two synagogues of the German Jews, and one of the Portuguese, 24 cubits broad and 42 long. Each one has its own management; thus the income of one is not mixed with that of the other, and each maintains its own staff and its poor respectively. Together they are estimated as amounting to about 6,000 souls. They possess houses and villas, in which they either dwell or lease to each other. Many of them ride in carriages, and there are same of them who are wealthy, with 30, 40, or 50,000 pezzi a year . 'Many of them who do not have [fixed] incomes have large businesses and one hears of large dowries among them, of 60 or 70,000 pezzi. Jews may dwell in any part of the City where they wish. They may practise any sort of trade or craft and open a shop in any place outside the City in the suburbs, and even in the City if they have practised the craft seven years under a master, in the same way as a Protestant may, the limits being those fixed for the City. 'They do not become excited in matters of religion and everyone who is observant is held in good repute, and when occasion arises each may speak his mind without concern or fear of being indicted, just as one may speak about the King, as it seems. even as wet-nurses, and entrust to them without any trouble their own little children to be brought up, the suspicion that they might baptise them never occurring to them. It bas never occurred, and if it should, they would be severely punished, and such a baptism would be held invalid. So without concern they send their little girls to Protestant women teachers, and little boys to Protestant teachers, to acquire manners and good qualities and learning. Some possess these assets and are very famous doctors and surgeons, held in great esteem, others are doctors of law and notaries, who command public confidence, and their notarial deeds are accepted equally with those of Protestants. One hears of no mockery or abuse of Jews as in other countries, where there is a certain vulgar weakness for persecuting and regarding Hebrews as something abominable who should be differentiated from the rest by Catholic law and be despised without distinction of case, terms, occasion, or quality of persons. 'There is no discrimination between Jew and Protestant in burdens or taxes. in which even the great are included, and they can all alike serve as constables and bear the King's arms, differing only by religion, which is not discussed. Each one is esteemed in terms of his action and behaviour as a gentleman, which is what they most esteem. Apart from the above-mentioned nationalities, there are in London some of every nation in the world, as all the world deals with England by way of commerce. Everyone observes freedom of belief, and as a result of this freedom one may see them often change and change again, once or more times, from one religion to the other, according to that which from time to time suits them best, and in proportion to the studies that they are making, since they are allowed to read all sorts of books and particularly the Holy Bible, which they always have ready at their fingertips. 'I saw during this time two Protestants become Jews and be circumcised, and two ladies likewise embrace the Jewish religion with great devotion. The difficulties that the Jews themselves place in the way of those who wish to become Jews are so great that it would seem impossible that anyone should resolve to take such a step. But when it is resolved, it is not taken for an ulterior motive but because they believe that infallibly they are doing rightly. After all the warnings to proselytes, when nothing remains but the act of circumcision, and the operation is to be performed, they bring out a great knife, like that with which the Jews slaughter cattle, which would put fear in a giant, shining like crystal, then the brave fellows resign thernselves to endure the pain in order to embrace the Hebrew religion and to believe in the Hebrew Law as the true Law. children belong to the husband and the female to the wife, and when they reach an age when they are capable of distinguishing, each may choose that religion which he or she desires. Hebrews with Protestant wives among them. It happened one day that the Wardens of the Community were at the Bishop's house. He asked them if the Jews had any shortage of women that they had need of marrying Protestants; but he did not forbid it them for this reason, as that would be against the rules of the Reformation'.